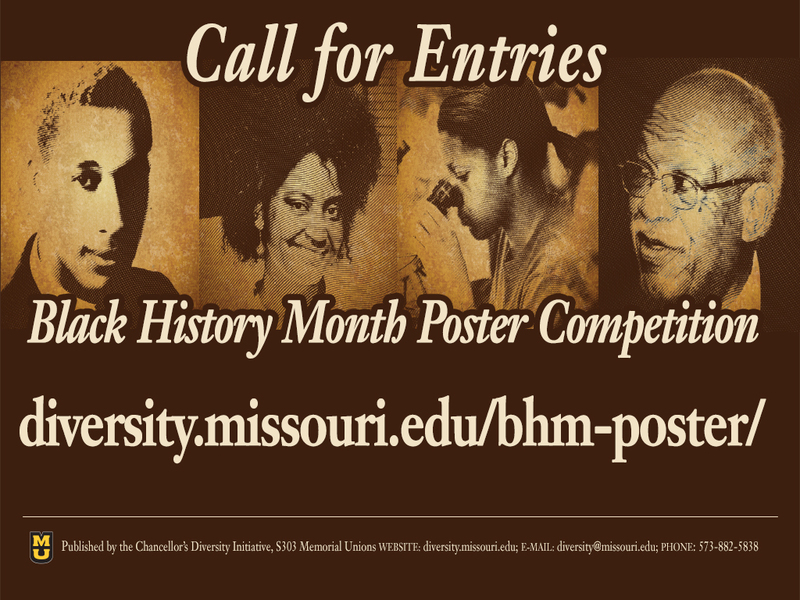 The University of Missouri’s Black History Month Poster Committee invites all currently enrolled MU students to enter the 2014 Black History Month Poster Competition. This year’s contest is open to all interested undergraduate and graduate students. Judges will select a unique, original poster design that celebrates and honors black culture, history and achievement at Mizzou. The purpose of the poster is to promote collaboration and participation within the greater campus community and to celebrate African-American heritage as it relates to Mizzou. The primary target audience for the poster will be prospective MU students from around the state of Missouri. The poster will be distributed to public and private high schools and non-profit youth organizations for display. All submissions are due to the Chancellor’s Diversity Initiative by 5 p.m. Friday, November 1, 2013. For more information, see the attached flier or visit http://diversity.missouri.edu/bhm-poster/.